The Twin Cities, Minneapolis/St. Paul are home to a host of family friendly attractions including the Mall of America, but on our recent visit as part of our #90DayRoadTrip, we spent an entire day dedicated to visiting educational museums that provided plenty of hands on activities for kids, while sneaking in learning in super fun and unique ways. The boys spent hours learning about science and the history of Minneapolis as well as a bit about the flour milling operation. 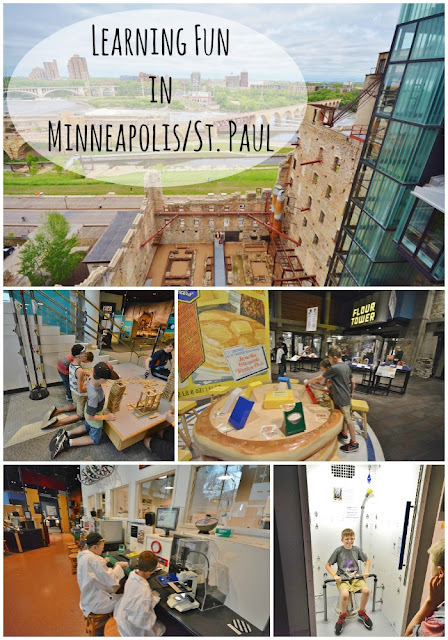 If learning fun is high on your list of priorities for family vacations, then you definitely need to consider both the Mill City Museum in downtown Minneapolis and the Science Museum of Minnesota in downtown St. Paul. Each is only about 20 minutes from the other, making it easy to fit both into an action packed day of learning. Located in downtown Minneapolis along the shores of the Mississippi River, the Mill City Museum is built into the ruins of the former Washburn A Mill. Established in 1874, the original A Mill was destroyed by an explosion caused by ignited flour dust in the late 1870's. It was rebuilt as what was then the most technologically advanced mill in the world in 1880. Operation at its highest produced enough flour to bake 12 million loaves of bread in a day! Eventually, the tides turned and the mill was no longer needed, officially shutting down operations abruptly in 1965. It sat empty for many years, home to many local homeless individuals, until most of it was destroyed in 1991 in a fire. The historical society purchased the ruins and have done a magnificent job of preserving what was left of the building, while creating an interactive learning experience for families. At the Mill City Museum, you can of course view the ruins and learn all about the explosion and subsequent fire that brought the Washburn A Mill to its current state. Other activities include creating your own cereal box, viewing examples of machinery used in period flour mills, exploring the wonder of hydro power in a water lab, and even trying you hand at creating delicious food in the baking lab. Perhaps my favorite part of the Mill City Museum is the Flour Tower tour. This 15 minute tour has you seated in a freight elevator as you travel up and down the 8 stories of the Mill City Museum. Periodically, your elevator doors open to reveal the mill just as it would have been in its heyday. You can hear the voices of the workers who actually worked in the mill at that time, and see how everything operated. At the end of the tour, the boys and I were allowed to go up with others to the 8th floor observation deck where the view of the ruins and Mississippi River below is just breathtaking. Looking to learn more about Minnesota? Families can also do this at the Mill City Museum with the Minnesota in 19 Minutes Flat film can be seen. Travel through the history of the state in just 19 minutes. A great way for kids to learn more without losing interest. The Mill City Museum is open Tuesday-Saturday 10am-5pm and Sundays Noon-5pm. Admission is $11 for adults and $6 for children 6-17. If you have a science lover in your family, the Science Museum of Minnesota is definitely not to be missed. This incredible complex of learning creates so much fun for kids, they won't even realize they are learning. There are literally hundreds of hands-on activities, including a nature trading station where you can bring in items from nature and earn points for them to trade for some of the other amazing nature items on display. I thought this was the most incredible thing I had ever seen! There are multiple floors of fun here, where you can learn about everything from weather, to shadows, wavelengths, hydro power, building, dinosaurs, the human body, future Earth, and right now, they have a special exhibit "Space: An Out-of-Gravity Experience." You can also purchase separate tickets to the on-site IMAX theater that shows a variety of films, we had the opportunity to view Journey to Space during our visit, which was the perfect tie in for the Space exhibit that is currently going on. Some of the highlights from our visit included the Cell Lab. I will tell you that I have not seen anything like it in any other science museum we have been too, and we have been to a lot of them. The boys donned lab coats, gloves and goggles to head into the cell lab and perform actual step by step experiments like viewing their own cheek cells on a microscope. They also spent a great deal of time in the Experiment gallery, where you can create your own flyer, see sound waves in motion, and learn about convection currents. There is also a volunteer-staffed area here where someone does science experiments for visitors. We say one about dry ice during our time there. If your child loves dinosaurs, the will enjoy the Dinosaurs and Fossils Gallery, and don't forget to head out for a chance to captain a river boat in the Mississippi River Gallery. The Science Museum of Minnesota is located in downtown St. Paul, just 20 minutes from the Mill City Museum. A parking ramp is located just next door, and admission is $13 for adults and $10 for children 4-12 to the museum only, with add-on prices for admission to the Omnitheater and visiting Space exhibit. The museum is open 9:30am-5:00pm Sunday, Tuesday and Wednesday, and 9:30am - 9pm Thursday-Saturday. Photo from the Radisson website. If you like the hustle and bustle of the city for attractions, but want somewhere quieter to relax with your family without the heavy traffic and noise, then Roseville, MN. is your perfect choice for where to stay when visiting Minneapolis and St. Paul. Just 10 miles North of the Twin Cities, Roseville is centrally located and has access to great accommodations, restaurants and shopping. 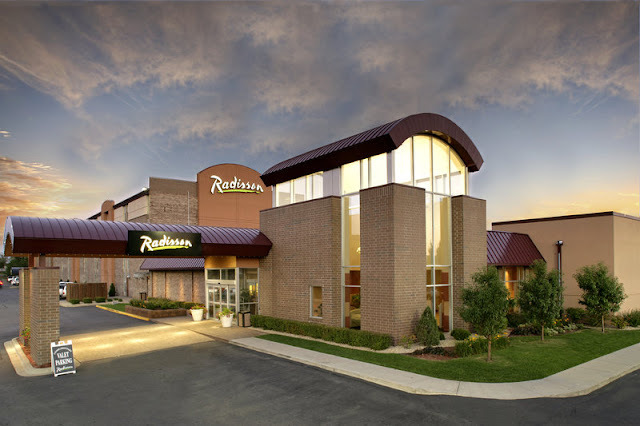 During our visit to the Twin Cities, we stayed at the Radisson Hotel Roseville. It was just a short drive back to our hotel at night from the many area attractions, and the prices were so affordable since it was just outside the larger cities. The Radisson Rooms are spacious and comfortable. We had two connecting rooms, one with two queen beds and one with a King sized bed and sofa sitting area. Both rooms came with wonderful amenities including microwaves, mini fridges, comfortable robes and beautifully scented bathroom products. The King sized bed in the room featured a Sleep Number mattress. This was my first time trying one of these beds, and I can tell you that my magic number for lounging and watching TV is 25, but when I get ready to go to sleep, I bumped it up to 45. I thought this was such a unique amenity, and it is one that would definitely have me choosing them over and over again. The Radisson Hotel Roseville also features on-site dining at the incredible Axel's restaurant, I highly recommend the Sunday Brunch Buffet. A fitness center, banquet/meeting area and the area's largest indoor pool and sauna round out the amenities that make this hotel an ideal choice when visiting the Twin Cities. Looking for things to do outside of the Twin Cities and closer to your hotel? Roseville has quite a few family friendly attractions of their own, and are conveniently located to many others, you can check out VisitRoseville.com for more information or to start planning your next vacation.